GrabPoints claims to be one of the highest paying survey and get-paid-to sites. But is GrabPoints a scam, or is it really one of the best options to make money like this? I decided to put their claims to a test and joined the site and tested it thoroughly myself to find out what it really offers. In this GrabPoints review I will show you how it works, what you can expect, give you an inside look, and reveal if it is truly better than other similar options. Disclosure: This article may contain affiliate/sponsored links. Click for more info. What is GrabPoints and what does the site offer? GrabPoints has existed since 2014, so compared to some similar sites it is fairly new. However, the site Zoombucks existed before this and was merged with this site and was relaunched as GrabPoints. Even though it has not existed as long as some of the similar sites, it has developed a good platform, and let me reveal right away that GrabPoints is legit and safe, and you can actually earn money here. It has a lot of ways you can earn. If it is then the right option for you depends on your preferences, so let’s now go over the earning methods it offers and how good they are, so you can see, if it is relevant for you. 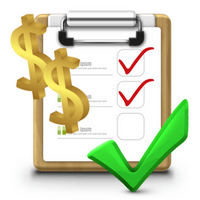 Paid surveys are a great way to earn and have your opinion heard at the same time. GrabPoints offers a lot of paid surveys. Most of them are offered through survey routers or third party providers, which means you will see the survey on GrabPoints, but when you click it, a new screen will open, and you will take the survey here. Once you finish the survey, you will get the reward into your GrabPoints account – in most cases you can see the reward in your account right away. GrabPoints has a cooperation with many survey routers and partners, and therefore you can also find a lot of surveys here. GrabPoints has a lot of different survey opportunities. Be aware that as on all other survey sites, you will not qualify for all the surveys you try, so sometimes you just have to try several times and be a bit patient to find the surveys you qualify for. But GrabPoints has a good amount of surveys, and you should find many you qualify for. After a while you can also figure out what type of surveys you mostly qualify for, and then focus mainly on these. According to GrabPoints themselves they pay higher rewards per survey than similar sites. They also regularly create comparison charts to show this. I took a look at one of these and compared it to my own experiences. The comparison chart from GrabPoints where I found a few errors. I most say that GrabPoints definitely has some of the highest rewards for some surveys. For example for the surveys through the Yoursurvey router. Here GrabPoints offers $0.94 per survey, and these surveys do not take long to do, so that can quickly add up. However, according to the chart PrizeRebel supposedly only pays 34 cents for the same surveys. This is not quite true. Maybe it is because the chart I got is not completely updated, but PrizeRebel has paid around 80 cents for these surveys for a long time, and I found other similar errors on the chart. The rewards on GrabPoints are in many cases definitely some of the highest, but if you see a comparison chart in general, it is a good idea to also check it for yourself and not just blindly believe the chart, as you do not know when it was last updated or what data was used to create it. 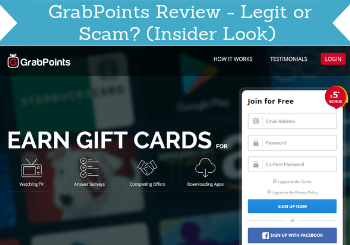 But overall, GrabPoints is a great place to take paid surveys, and with the rewards it gives, it can very quickly add up to a nice amount, so definitely an earning method that is worth using here. You can also get paid to watch videos on GrabPoints. You can watch as many as you want, and you will always be able to find videos you can watch to earn. There are videos within many categories, so you can choose to watch the type of video you are most interested in whether it is food, science, movies, celebrities, health, and more. You can earn by watching videos – however not the fastest way to earn on GrabPoints. This is however not a fast way to earn. To earn you have to watch 3 videos of around 2 minutes each + ads in between. A total it will probably be a round 8-10 minutes you have to watch to get the reward, which is 7 points (equals 7 cents). The big advantage of the videos is that you can always find available videos and earn. But as you can see, you will definitely not be able to earn as much watching videos, as you can by for example taking the paid surveys. In my opinion the video option is therefore mostly an interesting option, if you want to watch the videos anyways. If you do it only to earn, it will be a very slow progress, and there are better ways to earn on GrabPoints. Paid offers and offer walls can in general be a great way to boost your earnings on get-paid-to sites and is often an overlooked option. GrabPoints has a lot of offer walls and many offers you can earn rewards by taking. It can for example be to sign up for a free trial, buy a certain product, download a game, and more. Example of a GrabPoints offer. Be aware that for some of the offers you have to pay or register for a free trial that will continue as a paid service, if you do not cancel. The paid offers can sometimes still be worth it, as you can find offers where the reward you will get is higher than the cost you have. Also, if it is an offer you want anyways, it can also be a great way to save money. The offers can in general be a great way to boost your earnings. You just have to make sure to read the exact conditions before taking an offer, so you are sure what the demands are for you to get the reward. On the image above you can see an example of an offer on GrabPoints. To the right of the offer you can see a small icon. When you click this, you will be able to read the conditions for the offer. GrabPoints has a whole section with apps you can get paid to download, and there are quite a lot of options here. Some of them are great and easy ways to earn, and some of the offers are not so great. The apps section is worth checking out. As with the paid offers, make sure to read the conditions before downloading, so you know exactly what it requires to get your reward. Sometimes a certain amount of activity is required before you get your reward, and other times you just have to download and start the app to get the reward. This app section is definitely worth checking out once in a while, as it can be a great way to boost your earnings easily, if you find the right offers. If you have friends you think would like GrabPoints, you can earn extra rewards by inviting them. Once you are a member, you will see an invitation link, you can share with your friends. If they join, you will get a bonus, once they have earned 1000 points. How big a bonus you get depends on the country the friends you invited lives in. There are 3 different tiers. For tier 1 you will get 250 points, tier 2 will give you 150 points, and tier 3 countries will give you 25 points. On the platform you can see exactly which countries belong in which tier. It can be a nice way to make a little extra money, but as you can see, you need to know quite a lot of friends that will actively participate to make any real money, as the rewards you get for this are not very high. You have maybe somewhere seen that you can get GrabPoints invite codes that can give you an extra bonus when you join. It is a nice and easy way to get a bonus from the start. Because I have this website, I have been able to get such an invite code, so you as a visitor here can get some free points when you join. If you join through one of the links on this page, you will therefore get 500 points for free into your GrabPoints account right away. In addition to this you get another 50 points just for confirming your email and 10 points for answering a couple of easy demographic questions. So if you join through a link on this page, you will get a great start with your earnings on GrabPoints. Below I have created a video tutorial of GrabPoints, so you can get an inside look of the platform and see for yourself what it offers, and how to use it to earn. As you can see, you have quite a lot of opportunities to earn on GrabPoints. But one thing is the amount of points you can earn. Another thing it what you can get for these points, and this is an important aspect of any get-paid-to site. GrabPoints luckily has a good selection of rewards. When you take surveys, offers, etc. on the platform, you get paid in points. You can always see before doing anything on the platform how much you will get for it. The points can then be exchanged into gift cards or cash. The exact kinds of gift cards you can get depends on the country you live in but examples are Facebook credit, MineCraft, Xbox, and more. GrabPoints has a good selection of rewards and a low payout threshold. If you prefer getting your rewards out in cash, you can get paid either through PayPal or Skrill. I personally prefer getting my rewards in cash, and think it is great GrabPoints offers PayPal, as this is such an easy and fast way to get your money. The exact value of your points can vary a bit depending on the reward you choose. But in general 1.000 points is equivalent to $1. You can request a payout already when you have earned $3 (3.000 points), which will not take you long to reach. Also, the processing time of rewards is only 48 hours, so it does not take long from you have requested a payout until you have your reward. Be aware that if you are inactive for 30 days (meaning if you do not take any offers, surveys, download an app, or watch videos) your account will be reset to zero. So make sure to stay active and do something at least once in a while, or make sure to cash out before you take a break. How much money can you make? GrabPoints has some great rewards. But how much money is it in general possible to make here? That is a very difficult question to answer, as it depends a lot on the country you live in, and of course on the time you spend there. Because GrabPoints has so many earning opportunities, it is possible to spend quite a lot of time there and earn some really nice extra money. But if you only want to spend a little time once in a while, this is also possible. There is no requirement of how active you have to be. One thing that is however important to remember about any get-paid-to site or survey site is that you will not be able to make a full-time income from it or become rich. On GrabPoints you can definitely make some nice extra money, and it is one of the good options. But you should not do it, if you expect it to make you rich. Can you use it on mobile? Being able to use a survey and get-paid-to site on mobile is a great way to earn on the go, and whenever it fits into your schedule. GrabPoints does not as such have an app that makes this possible, but it is also not necessary on this platform. 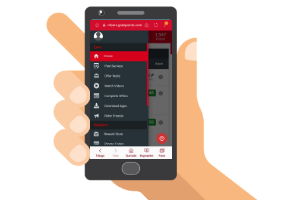 The platform is fully optimized for mobile, so you just open it in your browser on your mobile device, and then you can easily take surveys and offers from there. It is as easy to use on mobile, as it is on desktop. The advantage of using a site that works well on mobile without being an app is that it saves you the storage space for having to install another app. So it definitely is possible to use GrabPoints on mobile, and it is user-friendly there as well. A great thing about GrabPoints is that it is available worldwide. This means you can join from all countries. The minimum age is to join is 13 years. The amounts of opportunities you will get will vary from country to country, but it in general has good opportunities for many countries. So in most countries it will be worth giving it a try. Also, you can check out the best sites in your country here, to see other great opportunities for your specific country. But overall GrabPoints is one of the sites that is definitely worth joining from most countries. Being able to get support is great, as it shows something about how much a company cares about its customers. On GrabPoints you can submit a ticket, if you should need help. At first, it might be a little difficult to find this option, but if you go to the help section with the FAQ, you can also find the option to submit a ticket at the top of the screen. You find the support option at the top of the help section. Make sure to first read the FAQ, as it has answers for a lot of the most common questions. I have personally been in contact with GrabPoints a couple of times. I have received quick and useful replies the times I have been in contact with them, so if you at some point should need support, you can expect to get it there. I think it is clear from this review that there is no doubt that GrabPoints is a legit and safe site to join and use. But let’s sum up the pros and cons, so you can get a better overview and see, if it is the right option for you. Overall GrabPoints is definitely one of the survey and get-paid-to sites worth joining, and it is available worldwide. Be aware that in some countries there will not be as many opportunities as in others, but in general it has a good amount compared to many other sites. Also, you will not qualify for all surveys, but this goes for all survey sites. In my opinion the pros clearly outweigh the few cons, as it has many opportunities, great rewards, low payout threshold, and it is easy to use. It is very easy to join GrabPoints, if you have decided it is a site for you. You just click the link below, and then you will be taken to the sign-up page, where you can sign up (it only takes a just few seconds). After you join you have to confirm your email, and you can then start earning right away. Remember that by joining through the link below, you get 500 points for free. If you have any comments, questions, or have any experiences with GrabPoints yourself, I would love to hear from you in a comment below. GrabPoints is a legit and safe get-paid-to and survey site. It has a lot of earning opportunities and is available worldwide. You can get paid in cash or choose between many gift cards and can get paid already when you have earned $3, which will not take long with the amounts of opportunities it gives. One of the sites definitely worth joining. I clicked on your GrabPoints link to sign up and did not get the 500 point bonus. Otherwise I really like the info you have shared here on your post 🙂 Thank you for showing us these great survey sites! Thank you very much for letting me know Jim. I have had someone telling me this before and I was promised by GrabPoints that it should have been fixed – but apparently not. So thank you for telling me. I will write them right away and try to fix it and will also see if there is anything I can do to get you the points you were promised. I have now heard from GrabPoints and there apparently has been a technical glitch so you did not get the points and they will fix they invite link soon. But in the meantime, they said they would write to you with a code so you could get the points you were promised. So hope you have received the email from them and the points? Thanks for letting me know. I just contacted them about this about a week ago when someone else made me aware. They promised to fix it but apparently, it has not been fixed yet. Thank you very much for letting me know. I have written them again and asked them to make sure you get the promised points. About you not being able to edit your profile, I am not sure why that is. I would suggest you to ask GrabPoints support about this. And thanks for the feedback on my reviews. Very glad to hear you like them. Thanks for letting me know Joel. I have been told by GrabPoints that the invitation link will give those free points but seems like something has gone wrong then. Thanks for bringing this to my awareness. I will contact GrabPoints right away and check what has happened and get back to you as soon as I have an answer. I have now been in touch with GrabPoints and they confirmed to me that the invite code I have on my website should give people 500 free points when joining. If this is not the case for you, an technical error has happened. So if you can send me an email on mike @ paidfromsurveys.com with the email you used to sign up for GrabPoints, then they have promised to transfer the points manually to you. I have never heard of GrabPoints. It sounds somewhat similar to Clixsense and Neobux. Both of those have surveys and other offers as well as S’mores Tv. With Clixsesne you get cash in your main balance, not just collecting points, but it is a minimum of $10 to cashout at Clixsense. 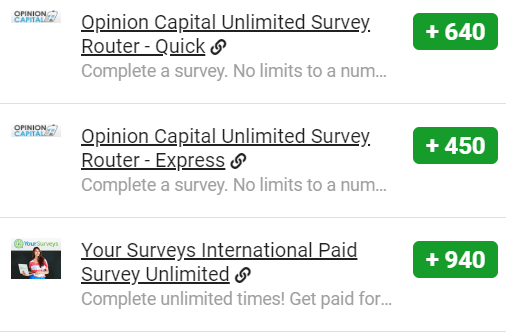 Those are the only ones that I have tried only because I have no time to do surveys and other offers on too many of these sites that have the same structure. They do pay and if you want to make a little cash on the side is a perfect way to start making money online. Thanks for sharing your experiences Shy. GrabPoints is in some ways similar to ClixSense – they just have different offers and survey opportunities, but both sites are great to join. GrabPoints also pays in cash, but you just get points in your account that can then be exchanged into cash. Neobux is a bit different and not really worth it in my opinion. It is too confusing, and it also has paid memberships, and to really have a chance of earning there, you would need to pay for upgrades and invite a lot of other people to join. So I see Neobux as quite different, and it is not a site I recommend or use any longer myself. GrabPoints sounds great for a person who has time on their hands. I think this would be a great opportunity for young first time mothers. As it would break the monotony of being home with having a little break time. What I really like here is that they give you actual rewards, many times you only get coupons or gift certificates to other site, at least here they pay out via Paypal, which means you can have something tangible come into your account. Thanks for a new lead for people who like to stay at home and make a little extra money. There are luckily by now many survey and get-paid-to sites that pay in cash. GrabPoints is not the only one, but it is definitely one of the sites with the highest rewards for the time spent. I personally tend to avoid these types if things. They can be an ok way to earn a little money. But I think time is usually better spent elsewhere. I do participate in paid surveys sometimes if I’m already just doing something like watching tv. But if there’s anything else more important I say skip the survey. Like you said in your article, you don’t make much money for your valuable time. Thanks for sharing your experiences Mariah. You can actually make some quite nice extra money by participating on a survey and get-paid-to sites, once you figure out to do it the most effective way, and if you join several of the high paying ones like for example GrabPoints. What I say is that you will not be able to make a full-time income with it, and people need to be aware of this, and not have this as the goal, as they will then for sure be disappointed. But it is one of the easiest ways to start making money online, and one of the only ways where you will start earning from day one and have no costs at all. It all depends on the expectations and goals, but it definitely can be a great way to make some extra money, and also have ones opinion heard at the same time. Hi Mikael! Thank you for the great review! We’re glad you had a great experience using the site – and we’re sure your readers will also enjoy using GrabPoints. We’d also like to add that processing time is only 48 hours. That’s one of the fastest processing speeds around! Thank you for letting me know about the processing time. I have now added this info to the review. Yes, your site paid me in 2 days on paypaL and if you got a few hours of time you can earn points on the tap research quickly. I enjoy the site and I had an issue once and they promptly replied and fixed it in a couple days. I hope to stay and be loyal as long as things stay that way. This is a great Grabpoints review. I haven’t personally heard of Grabpoints prior to reading about it here. I’ve heard of Swagbucks and other sites, but I haven’t been very excited about the earning potential after spending so much time doing the survey. 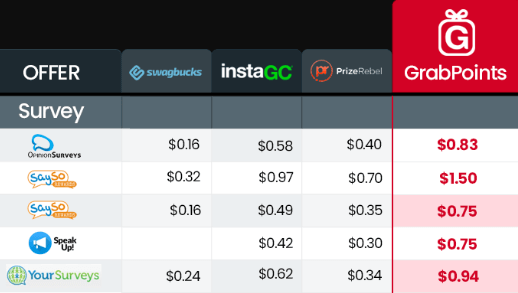 Your graphic showing the comparison between Grabpoints earnings and others like Swagbucks is pretty impressive. You mentioned that this is not something you could do for a full time income. It seems that you’d make less than minimum wage. What circumstances do you think would be ideal to do something like this? Can minors do these surveys? It is possible to make some really nice extra cash, if you live in one of the countries with the most opportunities, but as you say, it should be used as a way to make extra cash and not a way to make a living. I think it is ideal to make some extra cash when it fits into your schedule – that is how I use it anyways. You can always decide how little or how much you want to do, so it is very flexible. At the same time I also think it is a great way to have your opinion heard on important topics you would otherwise not have a say about. Some sites allow minors to join – I am actually not sure about GrabPoints, as I could not find any info about this. But I will investigate further and get back to you, as soon as I have an answer. Just to make sure – you mean you did not get 500 points in your account after joining through an invitation link on my website? Or are you referring to the $5 it says on the front page of GrabPoints you can get as a joining bonus? Because the $5 they announce on their front page is an error and not something they actually offer at the moment – I have checked with them, and they said they where going to remove it, as it had just been an internal test. But can see it is still there, even though they do not offer that. I will get in contact with them and let them know. But just wanted to check that you for sure did not get 500 points as a joining bonus through my website? Because then there is an error with the invitation link I got, and I need to have it fixed asap. Thanks for letting me know. Strange you did not get the 500 points. I will follow up with GrabPoints and see what might have happened. The $5 you saw advertised on the GrabPoints website was an error on their website as mentioned earlier, and it is not announced there any more either. A bit annoying and sorry to hear if that confused you. But will contact them right away and check up on the 500 points you should have received through my invite link. Anyways, I hope you will still enjoy the platform and feel free to keep me updated about how you like it. what do you know about Surveyclub? i recently received email from then requesting me to do surveys. I have not yet made a review of SurveyClub but planning to soon. However, it is not as such a survey site – you will only get access to a small list of other survey sites you then have to go and join. It is the same company that has SurveyScout, and it looks like the two sites are offering the same, and they are not worth it in my opinion. You can check out my review of SurveyScout for now to get a bit more info. Thank you very much for letting me know Darlene. I will look into it and make sure to update my Prolific review with the new info. Just wanted to let you know that I have now found out that GrabPoints is available to minors. It is possible to join for anyone that has turned 13 years. Wow, what an informative article! I am always seeing paid survey sites out there and I never know if they’re legit or if they’re a scam. I’m glad to hear that this one is legit. I’m definitely going to have to try it out. I have tried some others in the past and found that I qualify for very few surveys and the ones I did qualify for paid very little in rewards. It was incredibly frustrating. Hopefully GrabPoints is better. Glad you likes the article Taylor. On more or less all survey sites you will not qualify for all surveys. What I have found is that if you spend some time testing, you will be able to figure out what kind of surveys you mostly qualify for, and what kind you almost never qualify for. Then I just focus on the ones with the biggest chance of qualifying, and then it does not become so frustrating, as it otherwise can be. Hope you will enjoy GrabPoints and let me know, if you have any question about it. YEAH YOU CAN EARN POINTS QUICK I SEE, HAVENT BEEN ON THERE BUT COUPLE TIMES, BUT WENT THRU HISTORY, AND NO I DEF DID NOT RECEIVE THOSE POINTS.AND MYSURVEY IS ANNOYING ME. THEY HAD A COUPLE SURVEYS STOP AFTER COMPLETION, IVE SENT SCREENSHOTS AND SURVEY NUMBERS, TRYING TO GIVE ME EXPLANTIONS THAT DO NOT EVEN REPLY TO WHAT I AM TELLING THEM, AND IM STILL WAITING ON 2 PP REQUESTS . NOT SURE IF I SHOULD CONTINUE WITH THEM OR NOT, IM WEIGHING IT OUT,THEY WERE GOOD AND ALL OF A SUDDEN TURNING SOUR. I am having my contact at GrabPoints look into the issue about the missing points – will get back to you, when I hear back. Sorry to hear about the issue with MySurvey. Hope they will get back to you soon. Keep me updated. well mysurvey finally paid me, and im trying to sort this confusion with screening out on completion. I see i just got the promo code for the 500 points for Grabpoints, ty so much. Ill keep you posted on anything else. Great to hear everything has worked out. Thanks for keeping me updated. Yes the Mysurvey has issues. Tap Research is the EASIEST way to earn on Grabpoints, since you earn for every survey, whether 7 points for those you don’t qualify for, to higher amounts for partials, then higher amounts for completion. It does add up quickly. Thanks for sharing your experience Leanne. I like it. I might actually sign up. Like you said not an income but some extra cash…coffee money during the week. I’ll give it a go..if i find that it takes up too much time for too little reward, I’ll just stop. Thanks for the info. Now onto the surveys. Great to hear Dave. Hope you will like it, and feel free to come back and let me know how it goes. Learn how to make money on surveys the most effective way through this FREE 5-day crash course in paid surveys. Join by signing up for our newsletter and the course and start learning & earning today! We do NOT share your email with others.